Guaranteed Blister Free Socks – or your money back!! Go walking without the fear of painful and sore blisters! At Cherry Tree Country Clothing we really do understand how problematic sore feet and blisters are when out walking. We’ve been there and experienced them ourselves! But, there is a way that these can be avoided. Please read on. What if we said we will guarantee that you can walk for 1000 miles, without getting any new blisters? You might not believe this at first but if you purchase a pair of 1000 miles socks from us, we will be socked if you are not very surprised at the results! So, what causes blisters in the first place? Experts describe blisters as skin injuries that are caused by friction from sources such as a rubbing walking boot or shoe. If, for example, you take a long walk your skin can be rubbing against your footwear for a considerable time perhaps leading to a blister. Likewise, constant rubbing when taking even a short walk may have the same effect! Basically, as friction builds, the skin heats up creating tears between the top layer of the skin and those layers beneath. The gap created between the layers fills with a protective serum, creating a blister. This can be very painful if the tears between layers reach the nerve endings. How do the 1000 miles socks work? So how can we offer a guarantee with confidence? Well, at Cherry Tree Country Clothing, we certainly believe in the products we sell. The 1000 miles socks can be described as “A sock within a sock”. The inner layer of the socks neatly fits your foot, whilst the outer layer moves with your boot or shoe eliminating friction upon your skin. 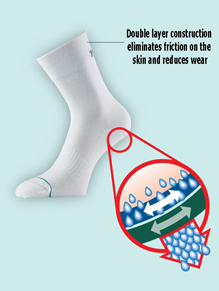 These socks are made from a mix of materials specifically designed to keep your feet cool, dry and blister free! Prepare yourself and your family well before your next hike or walk. Look at our online shop to view our socks or contact us directly on info@cherrytreecountryclothing.com to get advice and assistance for a blister free walk! At Cherry Tree Country Clothing we care about your feet as much as you do!